Texter och tecken från svensk medeltid, utg. av Per-Axel Wiktorsson. (Tracts and symbols from medieval Sweden.) Uppsala 2012. Samlingar utgivna av Svenska fornskriftsällskapet. Serie 3. Smärre texter och undersökningar 6. 96 pp. ISBN 978-91-976118-8-6. Margit J. Smith describes the Tallinn manuscript of the City Rights of King Magnus Eriksson, also referred to as the Vadstena Codex or Tallinn Codex, possibly written for the city of Åbo. The manuscript dates from the first half of the 15th century and is bound in the format of a girdle book, with brass bosses and two clasps. The binding was repaired in Moscow in the 1970s and is in good condition. Massimiliano Bampi maintains the the inclusion of Konung Alexander into an aristocratic environment in many respects has influenced the representation of Alexander’s deeds. However Alexander represents a powerful alternative to the heroes of chivalic adventure. Fulvio Ferrari writes, concerning Dikten om kung Albrekt, that its manuscripts were written at the Vadstena monastery during the 1420’s, commissioned by a member of the Swedish oligarchy. The text appears to have been written in the entourage of Bo Jonsson. The political situation during the 1420’s was the same as in Bo Jonsson’s time, when the aristocracy opposed the crown. Per-Axel Wiktorsson discusses a list of signs from the Vadstena monastery, discovered among MSS C 31 and C 74 held at Uppsala University Library, both from the 14th century. The list in C 31 is a pre-stage to that in C 74. The author has attemped to construct an older version of the list than the one in C 31. 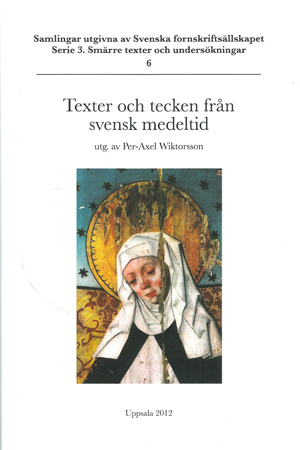 Keywords: Holy Bridget, Vadstena monastery, autographs, language and style, City Rights, ‘bag- binding’, Konung Alexander, courtly ethics, Dikten om kung Albrekt, aristocracy, the Crown, sign lists, older version.